I guess Zaha Hadid is the architect who we can’t get enough of; every single work which she creates amazes us and has the world talking about it! Whether she’s designing architecture, industrial design, or fashion, the 2004 Pritzker Prize winner has wowed us with all of her designs which have been presented throughout her career. 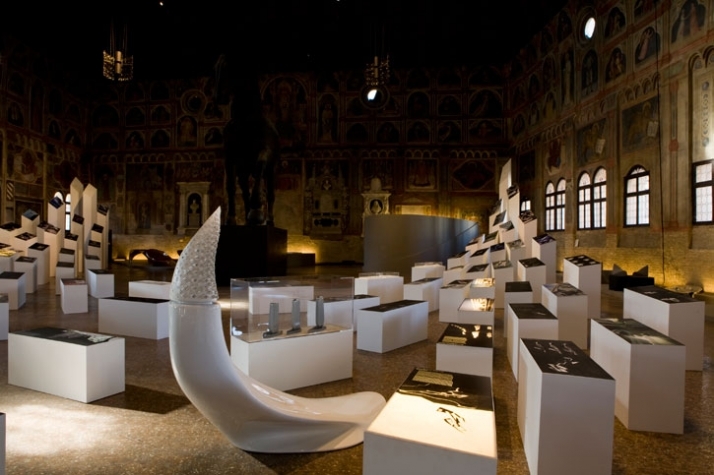 Luckily, as of October 27, 2009 a major retrospective of the works of Zaha Hadid Architects will be displayed at salone of Palazzo della Ragione, Padua, Italy. 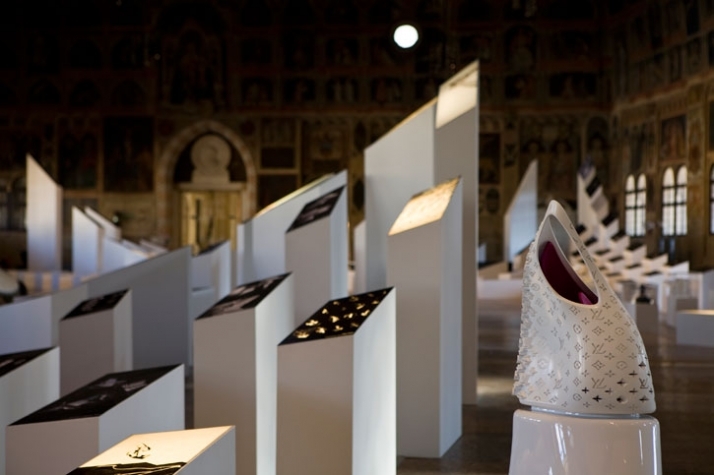 So if you ever wanted to see all of her works in one venue now is the time as all architectural, industrial and fashion designs will be on display until March 1, 2010. The exhibition examines Hadid’s sustained experimentation and research into digital design and construction methods at the cutting edge of the industry. 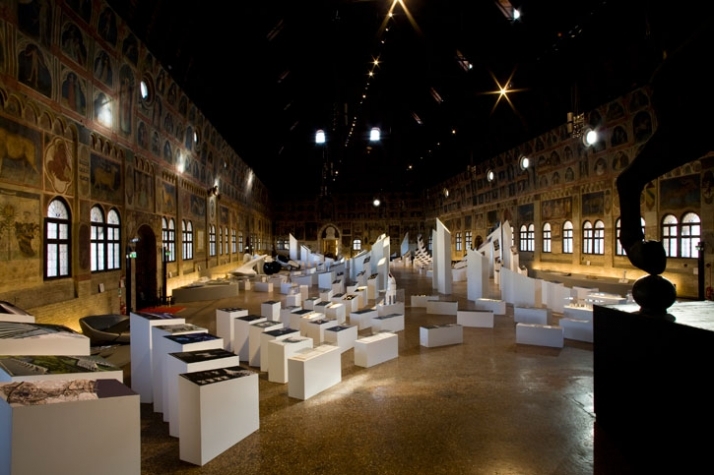 The historic qualities and character of the salone of Palazzo della Ragione building presented a demanding design challenge for the cutting edge innovative architect. The building was constructed in 1172-1219 and is considered one of the most notable monuments in Padua. Hadid organized the exhibition according to the environment within the building, articulating the intrinsic contextual relationships of her work. The exhibitions design respects the buildings qualities and history as the program creates Hadid’s distinctive liquid fluidity. The concept lying behind the well exhibited works is an interior urban landscape that should be considered as a large scale installation; a pixilated field defined by algorithmic formulae that introduce complexity and generate an interior urban condition. 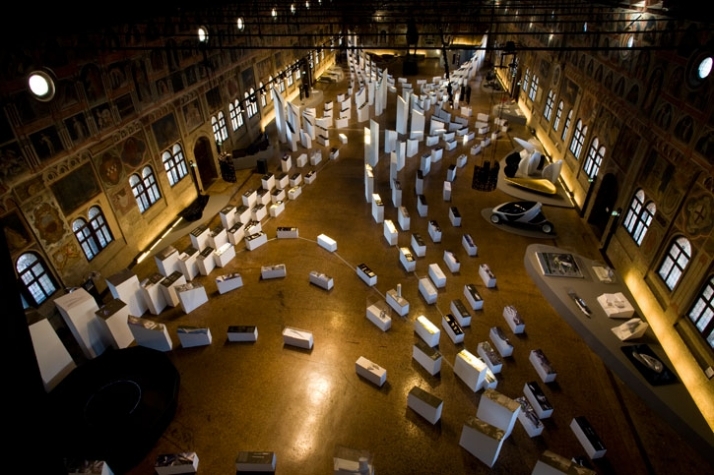 The existing space of the exhibition area has been transformed into a single fluid uninterrupted landscape that connects through the white individual fragments (projection stands) and clusters. The dynamic form created by the program represents the familiar bold contemporary Zaha Hadid design characteristic. Her organic forms are innovative, as this architect pushes design into new boundaries through new technology and material and never does the ordinary. When looking at the floor plan of the exhibition, it seems as if it extends into the space and prolongs its organic shape. 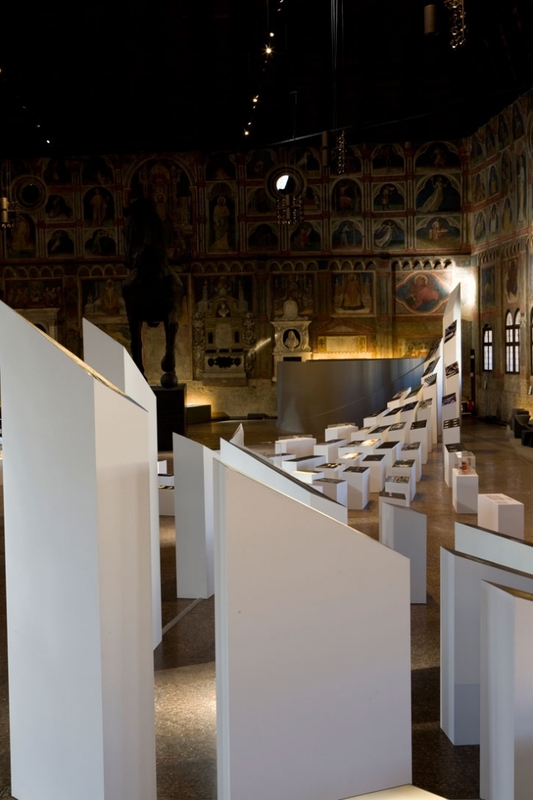 The white irregular shaped exhibition stands stand out of the buildings grey mosaic floor, and lead the way like a valley extends into the mountains. 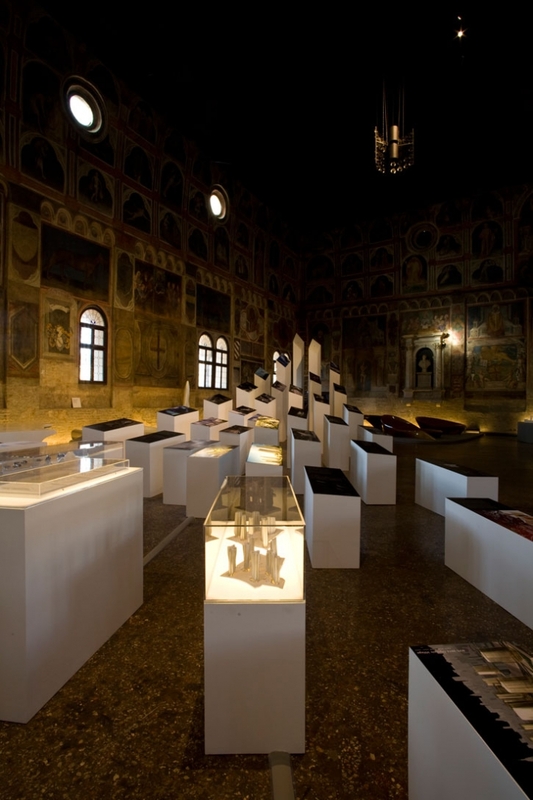 As if the exhibition stands want to draw the attention of the viewer not only to the displays but also to present this historic buildings interior. The exhibition works are not classified by the usual and expected category of typology or chronology but by the design and agenda that generated them, regardless of their function or scale. 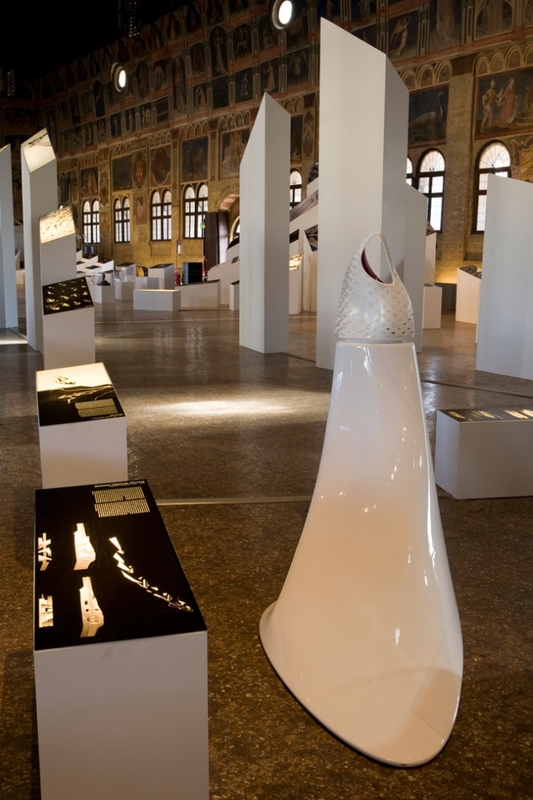 Apart from her architectural designs which are grouped by the type of form which has been given, Hadid also presents a wide range of her product designs. Such notable product designs include Vitra’s Mesa Table, Artemide’s Genesy Lamp, Aqua Table for Established & Sons, Melissa Shoes, sofas for Sawaya & Moroni and B&B Italia, and last but not least Louis Vuitton’s Iconic bag which is made of molded plastic and comes with its own stand and two stools! 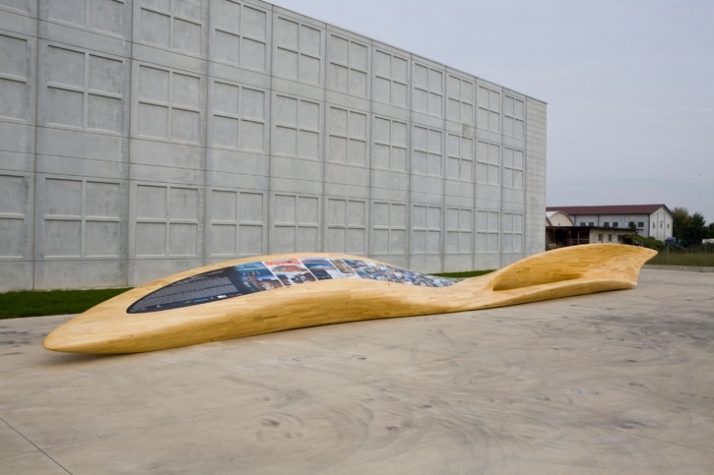 Right outside this historic building on Cavour Square in Padua, Zaha Hadid Architects designed an astonishing 20 meter long wooden table with seating. The construction takes an intertwining design and has created wood to act as a plasticity material through the usage of ground-breaking materials and challenging construction techniques by the main contractor Ar.Te. 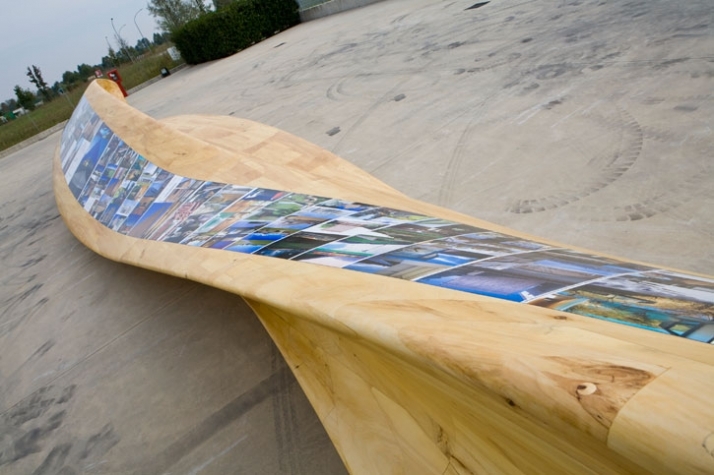 The traditional construction method and perception of wood as a material is redefined through this unique and highly innovative design. 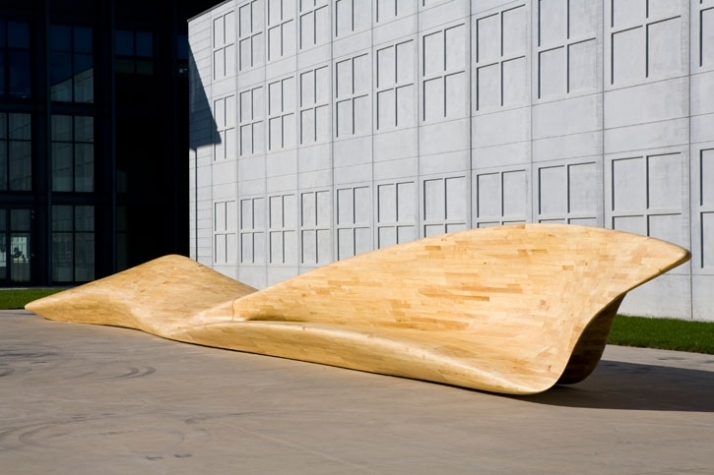 Giving a unique form where the wood rises and falls in a wave-like motion. This dynamic design attracts the attention of the pedestrian and creates an illusion of movement through its blob-like, organic form. Furthermore, form follows function as this surface isn’t only an astonishing design but also functions as a seating area. Another function of this sculpture like form is that the top surface is panelized and presents a series of elements that can display projects of the 2009 Barbara Cappochin Biennale. Moreover, this seven and a half ton piece is subdivided into modules allowing for easy transportation to several locations worldwide. What can one say about this ground-breaking architect who is the winner of many international competitions as well as the winner of the 2004 Pritzker Prize. The Pritzker Prize is awarded annually by the Hyatt Foundation to honor "a living architect whose built work demonstrates a combination of those qualities of talent, vision and commitment, which has produced consistent and significant contributions to humanity and the built environment through the art of architecture.” A number of Hadid’s winning designs were initially never built, as she tested boundaries of architecture and construction which were ahead of their time. However, today we are only happy to see her designs being constructed and visible throughout the world!